My first visit to Pongola was an emotional one – I survived an attempted hijacking (okay – maybe ‘attempted’ is an exaggeration – but it was jolly scary none-the-less) at the Wimpy near the Engen garage when I came up late in 2016 to present the SugarBytes concept to the Pongola Mill Group Board. The upside of that visit was that the committee saw the value for their farmers to partake in the initiative and Pongola became the 4th area included in the SugarBytes venture – and that meant I had a chance to visit Pongola again and create a new impression. So, on Monday 5th June I began the great trek to Northern Natal, to my first farmer of the expedition: Du Plessis Trust. I had made the appointment with Charl Du Plessis. He is young, energetic, focused and way too busy to meet with me so he graciously directed me to his Dad’s office. Thank you Thinus, for making the time to spend with me and tolerating my endless questions – all in English. Thinus, Charl Junior and Charl. Thinus Du Plessis is a salt of the earth, gentle and compassionate person. He is an intensely proud Dad and doesn’t take his wonderful life for granted. He has worked hard and instilled that excellent work ethic in Charl, who literally ran around the farm while I was there. They had recently had drip irrigation installed and it required intense focus least there be an error at this critical phase of this expensive venture. I hadn’t fully realised how Afrikaans Pongola is, and how linguistically unskilled I am. Thinus kicked off the interview explaining how they had managed to tame a beautiful girl from Underberg when Charl brought home his English bride, Mel – lucky for me, she had provided enough English practice for Thinus to manage excellently and I am extremely grateful for his command of my language. But, as a result of this trip north, I am now publishing all future articles in Afrikaans as well as English. Not because I do not believe that Afrikaans first-language people can’t understand the English but because I want to acknowledge the value of the language and honour our many farmers for whom this is their mother tongue. So, if Afrikaans is your preference, please scroll to the end of the English version to see the start of the Afrikaans version. We kick off with some background on this family: Thinus grew up on an ostrich farm in Oudsthoorn. His family is still involved with Ostrich farming there. His break came about 33 years ago, in 1984, when he went on holiday with his girlfriend, and her parents, to Sodwana. When they passed through Pongola, he knew immediately that this is where he wanted to be. An instant connection that was to draw him back. He did that a few years later and bought the farm they are on now. Thinus has four children. Charl is the eldest, followed by another boy, Thinus, who is a medical doctor and he was followed by yet another boy: this one you’ll all know – Jacques, who is currently playing rugby in France but has played for the Bulls and the U20 Bok team. Thinus snr. was also an avid rugby player and formed part of the Boland team for a while. At last, the Du Plessis were blessed with a daughter, Danelle, who completes the team of six. Although, that team is already growing and Charl Junior, at 19 months, is the latest recruit. Here is Jacques with another Du Plessis (no direct relation). I imagine they’re discussing the tactical distraction value of exposed cleavages. I confess to being distracted by the human interest angle on many farmers and particularly so with the Du Plessis. But, here I am, refocussing for the rest of the article! There were 2 ½ years severe drought here in Pongola. The area’s averages went from 89t/hect to 61t/hect. Thinus’s averages went from 115t/hect to 86t/hect. For him, this loss translated to R20 000 per hectare (about R2mill for the season) and therefore concerned him greatly, even though his figures were still incredibly impressive. What did he learn during this stressful time? Watch every drop of water. 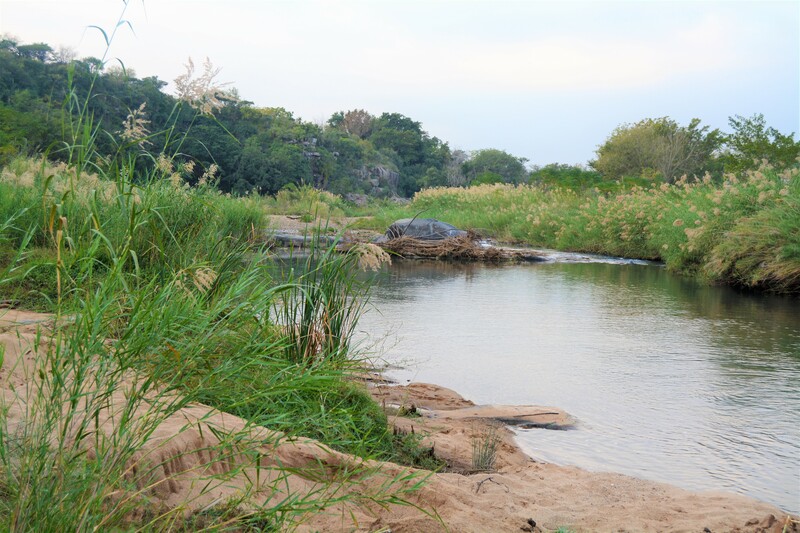 Thinus realised his dam was full of silt and set about clearing this to prevent damage to irrigation systems and make better use of the water that did make it into the dam. Drip irrigation. They are finishing up with an installation of 30hect of sub-soil drip irrigation. 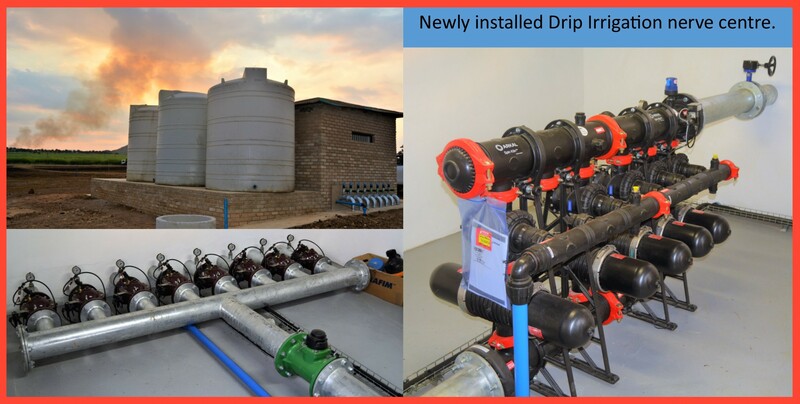 Although this is a very expensive project he believes it is wise because of the lower evaporation cost and the timing benefits of drip irrigation over sprinklers which is what his farm has always had. Sprinklers take more or less 7 days to get through a cane field, where as drip will cover the same area in a much lessor time. 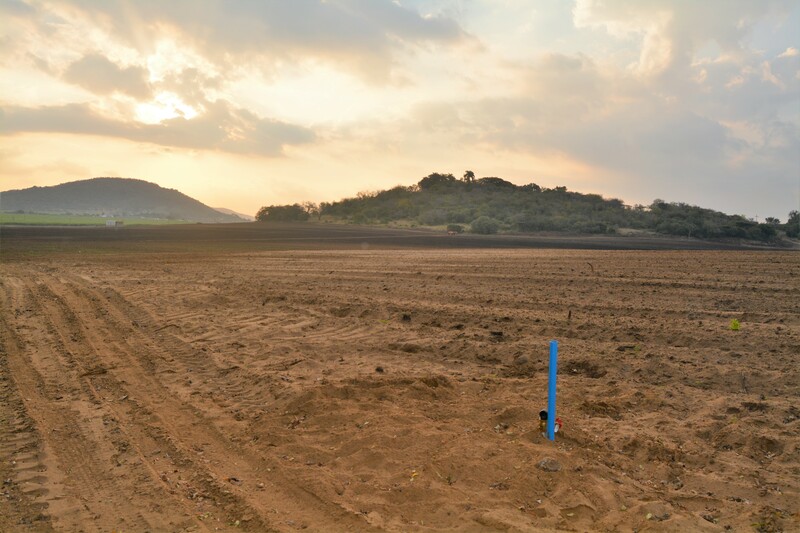 Right now, in Pongola, there are about 5 farmers changing fields over to drip. Inyoni Irrigation is the company the Du Plessis contracted to handle this project for them. Obviously, these new drip fields are being replanted and Thinus is using a new spacing that works for the irrigation. He will also be limiting in-field traffic (and therefore compaction) and using Matriarchs as opposed to conventional loaders. Previously the spacing has been 2 lines in 1,45m. Now, there will be 4 lines in a 2m spacing. This means he will get 3400m more cane into (and out of) these fields. 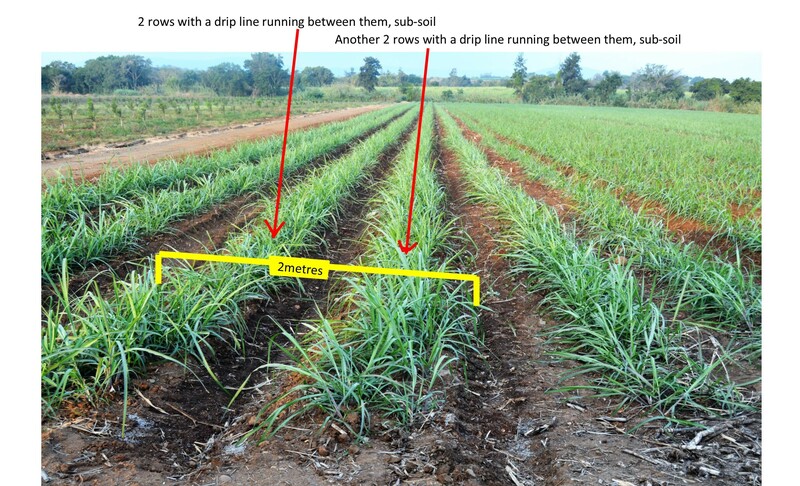 Another advantage of drip irrigation is that the cane will last longer, so – although ploughing out will mean repiping a field, he will have to do it less often. The only disadvantage of drip is the cost but they are confident that this investment will already show a return within the first two years. Here are some pics of the pump house. The in-soil probes on these systems will advise the farmer of the water level via an app. if the moisture levels drop below a required level. In response, the farmer can programme the water schedule on a computer and irrigate accordingly. Now THAT’S next level! In terms of general irrigation advice: Thinus insists that in-depth knowledge of each individual field is essential. Each field is unique and will have different moisture requirements. He customises irrigation programmes accordingly. Some fields never see a sprinkler. Again – there is no recipe. “Spend time in the fields. 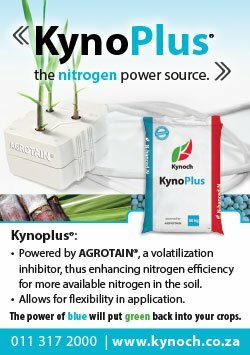 Learn what each one needs.” Right now, Thinus likes the idea of drip for his fields but will see how these 30 hectares do. If they yield the 150t/hect he is expecting, it will justify the cost and he will consider putting in more. Thinus believes in regular soil sampling. Previously, he has sent samples internationally but is now content that SASRI’s analysis and assessment is sufficient. He applies at least 25% less fertiliser than other farmers because his soil health is so good. After every plough-out, he always puts in +- 2,5t/hect of gypsum. After harvest, he applies LAN-based fertiliser and high ph fields get Ammonium Sulphide in addition. 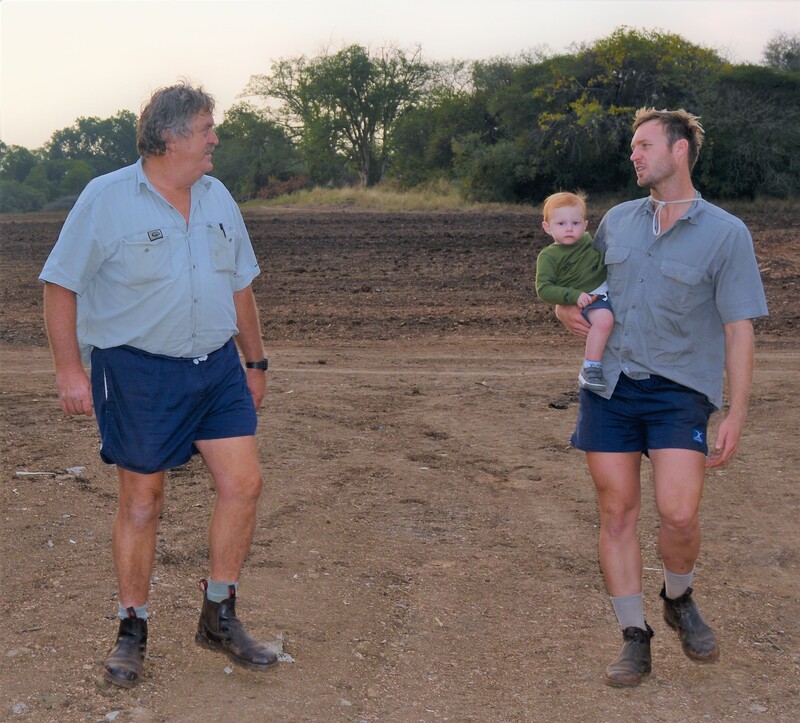 The Du Plessis choose to mix their own fertilisers which saves them R800 per ton. He cannot understand why other farmers don’t use this simple cost saving practice as it also provides the surety that the mix you are applying to your fields is in fact, exactly what you ordered and what it needs. As far as details on NPK etc, he cannot give more advice other than to spend time getting to know your own fields. When you do that, it becomes easy to give them what they need to produce well. Thinus and Charl handle all the ploughing of any fields to be planted. They operate the tractors themselves and believe that this ‘intimate’ time with the field cannot be overvalued. You see and learn things during this simple practice that will set that field up for success (rocks, soil quality, compaction etc). Many farmers see tractor work as unworthy of their time, but Thinus insists it is a huge contributor to their success. It is a welcome task for Thinus who is clearly in love with his chosen life – he rises at 4.30, starts work at about 5 and only spends about 10% of his time in his office. If he’s still out farming at 9pm, it’s all good. Office work is minimised by the fact that they run very few accounts. Mel, Charl’s wife, is helping with the office admin and their Auditor helps by redflagging any budget deviations he sees. A simple but highly successful operation. Chicken litter has recently been applied to this field – see the shavings. Nice organic richness. There is a field, on the farm the Du Plessis have just bought, that is almost entirely sand as a result of the Domoina floods. They will be using chicken litter here to supplement the organic content. Immediately after a field is cut, it is irrigated. Then a long-acting (6 to 12 weeks) herbicide is applied. Once the field is planted, and the long acting has had its time, they go through with hand-sprayers with specific people looking for specific weeds – ie: each person is spot spraying the weed specific to the chemical in their knapsack. Charl has put a lot of effort into refining their herbicide programme and it has shown huge results. They used to spray strong herbicides that killed everything but now they don’t need to because their farm is much cleaner. The highly focused programme they follow now reduces costs. In case some KZN farmers are interested: canopies here form in about 3 months during the winter months and within 4 weeks during summer. Thinus shakes his head though, muttering that Kweek is always a challenge and one that keeps them busy constantly. Again, this is something that is unique to each farm’s circumstances and environment but some general advice is to have a range of at least 4 varieties at any one time. This is because diseases are usually variety-specific and having a range will limit your exposure and loss in case of an infection. On this farm, right now, Thinus has N57, N53, N49 and N36. Thinus, in front of some hugely impressive N57. 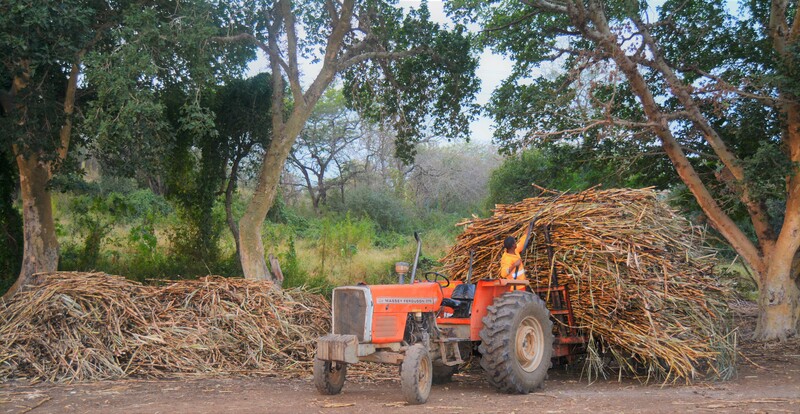 Although this farm does not battle with Eldana, they do remain aware and maintain certain practices to keep counts low: they reduce carry over cane because that is more susceptible. They also ensure that the cutters cut low to the ground. Of greater concern is RSD and they effectively combat any spread of this by dipping their cane knives in a sterilising mixture twice a day minimum. A 20 litre bucket goes with every team, every day and they are encouraged to dip their knives regularly. Unfortunately, RSD is not visible so the war is fought “blind”. Testing for this issue is done annually. This farm has been clean for a long time but they continue the healthy practice of knife-dipping. On this farm, all fields are ripened. Thinus uses Fusilade and has been one of the pioneering testers of Moddus. 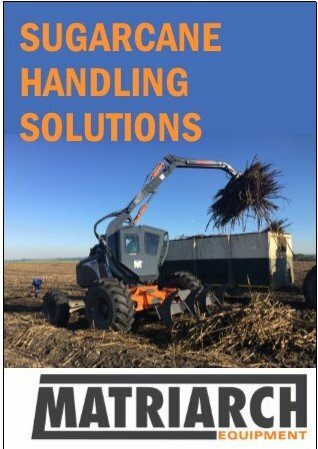 He likes this new product by Syngenta because, if you don’t cut the cane, it will continue to grow (after a period) allowing greater flexibility with cane at the end of the season. Years ago, in association with the Experiment Station they developed a Ventury spraying system. This system couples with the sprinkler irrigation to deliver the chemicals. As the mill subsidises all ripening (whether or not an aeroplane is used) this system is financially rewarding. The land that is currently flood- or drip-irrigated is sprayed with an aeroplane. RV’s on this successful farm are as impressive as the tonnages. The cutters work for 8 months and then have option to go home. They stay on if they want to, handling all the maintenance and off season crops on the farm. There are no managers, apart from Thinus and Charl. They handle all management themselves and value the closeness they have to all matters on the farm. Green is the colour of choice. The Du Plessis are John Deere fans. They switched to these machines four years ago and insist that they’ll never look back. Their most valuable investment has been a fancy tractor for spraying. It has a cab, aircon and radio. The appreciation of the driver is what has made this such a great investment. Nothing is too much to ask of this man since he received his new ride. Thinus says there are no secrets to success in this operation: just straight forward “best practice”: Burn today, cut tomorrow. Have your cane in the mill within 24 hours. He explains the cost of not sticking to this simple timing – ½% RV per day. This translates to R8500 per hectare per day. On a 100 hectare farm, this could add up to a staggering R850 000! It shows how easy it is to lose money but also, how easy it is to NOT lose it. Stay in touch with the farm, work hard, keep up. Pongola Sugar Mill in the distance. Nice and close. 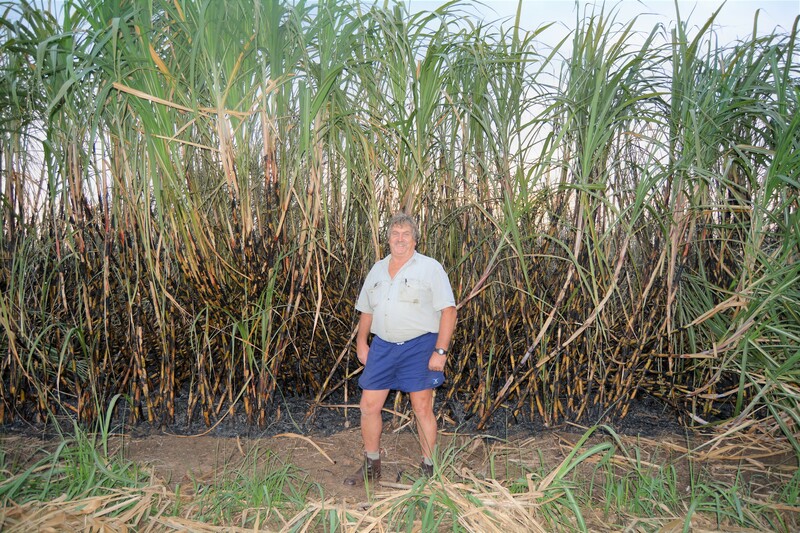 The Du Plessis are registered seed cane suppliers so usually fulfil all their own seed cane needs. This year, he is short though and will be buying in – it is a good opportunity to get a new variety in, thereby increasing his range to a healthy 4 varieties. The Du Plessis have a young orchard of Macs, the oldest of which are three years. Thinus plans to put some more in during October this year. At heart, this is a loyal cane farmer and he won’t be sacrificing any more cane lands to macs. If he decides to do more than he has planned currently, he will use some of his uncultivated lands or buy new property. How often haven’t we heard that the devil is in the detail or that excellence is just an accumulation of many tiny things, all done well? 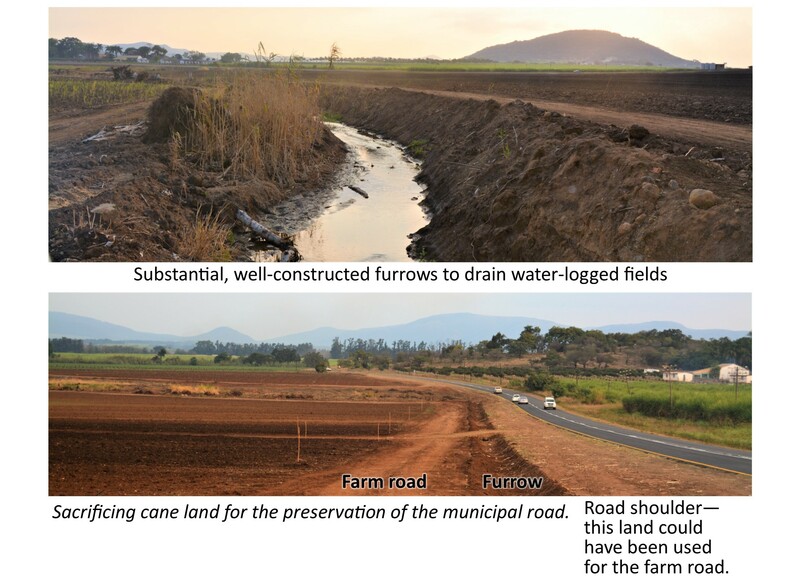 I sincerely believe in this phenomena and saw evidence of the same in the Du Plessis success: tiny things, like respecting the road edge, or proper drainage channels, or just a ethical thread running through all farm management decisions … things that are not going to alter your bottom line perceptibly. Instead they are things that differentiate a good farmer from a great one. I salute this family for being truly great farmers! Realise the value of a knowledgeable Extension Officer. Thinus says that Marius Adendorff spends more time on this farm than his own best friend. He does nothing without first consulting Marius. 95% of the time Marius says “that’s fine, do it.” But, it’s that 5%, when Marius has a better suggestion that has either saved Thinus a lot of money or helped him to avoid a substantial mistake. Be appreciative. Thinus knows it is a privilege to be a farmer – to be your own boss, with no traffic and to be able to do your own thing. He says all this has to be appreciated. “It is therefore essential that, each and every day, you complete a full quota of work. Without maximum effort, the farming and wonderful lifestyle won’t be sustainable.” I saw a love and appreciation of another kind as well: as we were driving through the farm, Thinus’ face lit up and he said: “There’s my son.” He turned to me and said “I am so grateful for a son who works hard and is so self-motivated. So often you hear of families who battle to work together. I am so lucky – Charl is incredible. I couldn’t ask for a better son.” We stopped the bakkie and they chatted about all that Charl had attended to with the drip installation. Their mutual respect and admiration was tangible. Well done DuP boys -you are inspirational! Believe in what you do. 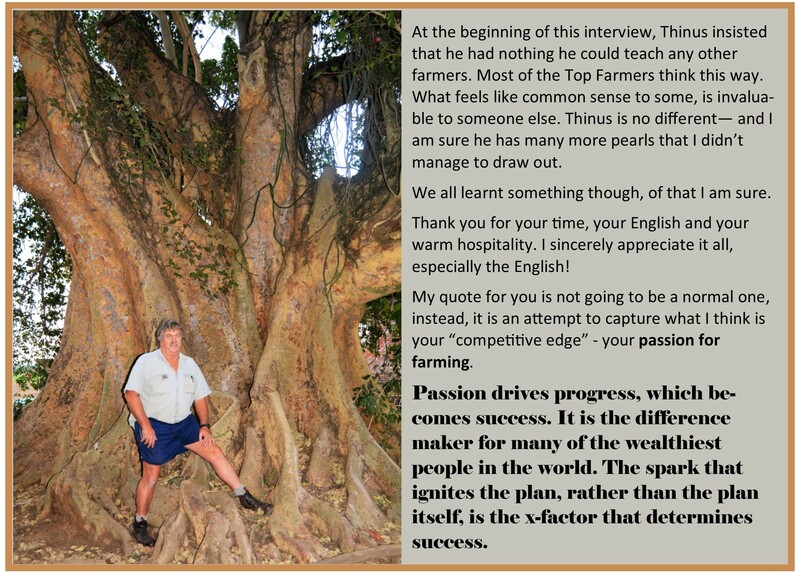 Thinus believes in this country, his product, and he loves his farm passionately. Academic farming is useful to a point, but to take it to the next level, takes belief and passion. Then suddenly, the sun was setting. I needed to find my B&B. The day was over. Groei siklus 12 maande. Genoeg sonlig en water op plaas vir die suikerriet om binne 12 maande volle potensiaal te bereik. My eerste besoek aan Pongola was ‘n emosionele een – ek het ‘n poging tot motorkaping oorleef (goed, miskien is ‘n “poging” bietjie van ‘n oordrywing, maar dit was nog steeds baie skrikwekkend) by die Wimpy naby die Engen vulstasie toe ek in 2016 die “SugarBytes” konsep aan die Pongola Meule Groepsraad kom voorlê het. Die positiewe uitkoms van daardie besoek, was dat die komitee die waarde kon insien om hulle boere deel te maak van die inisiatief, en so word Pongola die 4de area wat ingesluit word in die SugarBytes onderneming. Dit bring ook mee dat ek weer die geleentheid kry om Pongola toe te gaan en ‘n nuwe indruk te maak. So gebeur dit toe dat ek op Maandag, 5 Junie, die groot trek na Noord-Natal begin, oppad na die eerste boere op my ekspidisie: Du Plessis Trust. Ek het die afspraak gemaak met Charl Du Plessis. Hy is jonk, energiek, gefokus en heeltemal te besig om my te ontmoet en verwys my na sy pa se kantoor. Dankie Thinus, dat jy tyd vir my gemaak het en met my uitgehou het terwyl ek eindelose vrae gevra het, en dit alles boon-op in Engels! Thinus, Charl Junior en Charl. 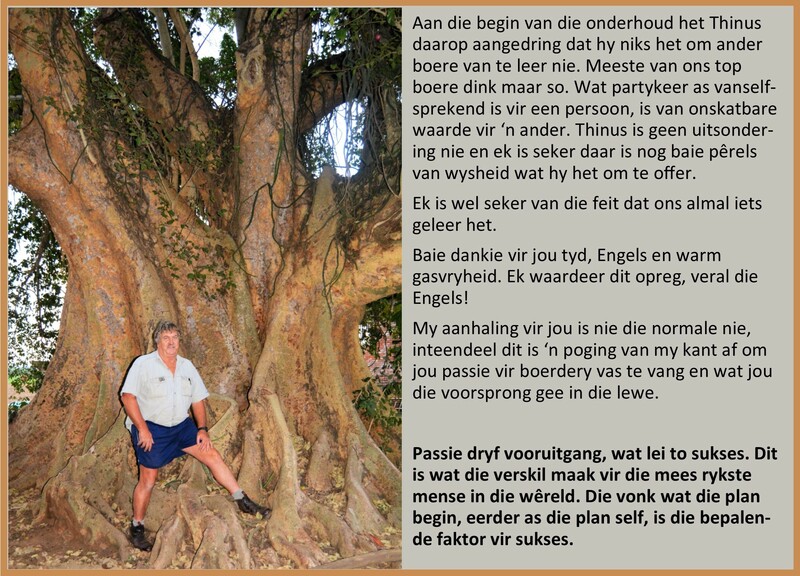 Thinus Du Plessis is ‘n sout van die aarde mens, saggeaard en vol passie. Hy is ook ‘n baie trotse Pa en neem niks van sy wonderlike lewe as vanselfsprekend nie. Hy werk baie hard en het sy uitstekende werksetiek aan Charl oorgedra, wie letterlik op die hele plaas rond gehardloop het terwyl ek daar was. Hulle het onlangs drup-besproeiing geïnstalleer wat intense fokus op die oomblik benodig om seker te maak dat daar geen probleme ontstaan tydens die kritiese fase van hierdie duur onderneming nie. Ek was nie heeltemal bewus van presies hoé Afrikaans Pongola was, en hoe taalgestremd ek werklik is nie. Thinus skop die onderhoud af waar hy aan my verduidelik hoe hulle dit reggekry het om ‘n beeldskone jonge dame van die Onderberg te tem, en hoe Charl sy Engelse bruid, Melanie, huistoe gebring het. (Gelukkig vir my, het sy genoeg engelse afrigting aan Thinus gegee om uitstekend met my te kon kommunikeer en ek is baie dankbaar vir sy kennis van my taal). My ondervinding met die reis Noord, het my laat besef dat ek al my toekomstige artikels in beide Afrikaans en Engels moet publiseer. Dit is nie omdat ek glo dat Afrikaans Moedertaal gebruikers, nie Engels kan verstaan nie, maar ek wil graag erkenning gee aan Afrikaans en die boere waarmee ek werk wil respekteer in hulle eie moedertaal. Ons begin met ‘n bietjie agtergrond oor sy familie. Thinus het groot gword op ‘n volstruisplaas buite Oudsthoorn. Sy familie is steeds betrokke by die volstruis boerdery daar. Sy deurbraak het sowat 33 jaar terug, in 1984, gekom toe hy saam met sy meisie en haar familie op vakansie was in Sodwana. Oppad soontoe het hulle deur Pongola gery en hy het dadelik geweet dis waar hy wou wees, ‘n onmiddelike konneksiewat hom ‘n paar jaar later sou terug bring hierheen om sy huidige plaas te koop. Thinus het vier kinders. Charl is die oudste, gevolg deur nog ‘n seun, Thinus, ‘n mediese dokter, en toe nog ‘n seun (wat almal ken) Jacques, wie nou vir Frankryk rugby speel, maar wat van tevore vir die Bulle en die o/20 Bokke uitgedraf het. Thinus was self ‘n kranige rugbyspeler op sy tyd en het deel uitgemaak van die Boland span vir ‘n rukkie. Laastens is die Du Plessis gesin geseën met ‘n dogter, Danelle, wat die gesin van 6 voltooi het. Hierdie span is reeds besig om te groei met die mees onlangse toevoeging, Charl Junior, 19 maande oud. Hier is ‘n foto van Jacques met nog ‘n Du Plessis (nie direk verwant). Ek dink hulle bespreek die taktiese afleidings waarde van ontblote boesems. Ek erken dat ek bietjie afgelei is deur die menslike belangstelling van so baie boere en spesifiek met die Du Plessis. Maar, hier is ek nou, geherfokus op die res van die artikel! Daar was 2 ½ jaar erge droogte in Pongola. Die area se gemiddelde opbrengste het geval 89t/hektaar na 61t/hektaar. Thinus se gemiddeld het geval van 115t/hektaar na 86t/hektaar. Sy persoonlike verlies het omgeskakel na R20 000 per hektaar (ongeveer R2 miljoen vir die seisoen) en alhoewel dit hom gekwel het, was sy opbrengs nog steeds baie indrukwekkend. Wat het hy gedurende hierde stresvolle tyd geleer? Hou aan om hard te werk. Bewaar elke druppel water. Thinus het besef sy dam was vol slik en het plan gemaak om die dam skoon te kry om skade aan die besproeiingstelsel te voorkom en om beter gebruik te maak van die water wat nie die dam bereik nie. Drup-besproeiing. Hulle is tans besig om 30 hektaar se ondergrondse drup-besproeiing se installasie te voltooi. Alhoewel hierdie ‘n baie duur projek is, glo hy dat dit ‘n wyse besluit is aangesien daar laer verdampingskoste is, sowel as tydsvoordele wat drup-besproeiing het teenoor die sproeiers wat die plaas nog altyd gebruik het. Sproeiers neem 7 dae om deur die suikerriet plantasie te beweeg. Drup besproeiing besproei dieselfde oppervlak binne een tot twee ure. Daar is op die oomblik omtrent 5 boere in Pongola wat besig is om oor te skakel na drup-besproeiing. 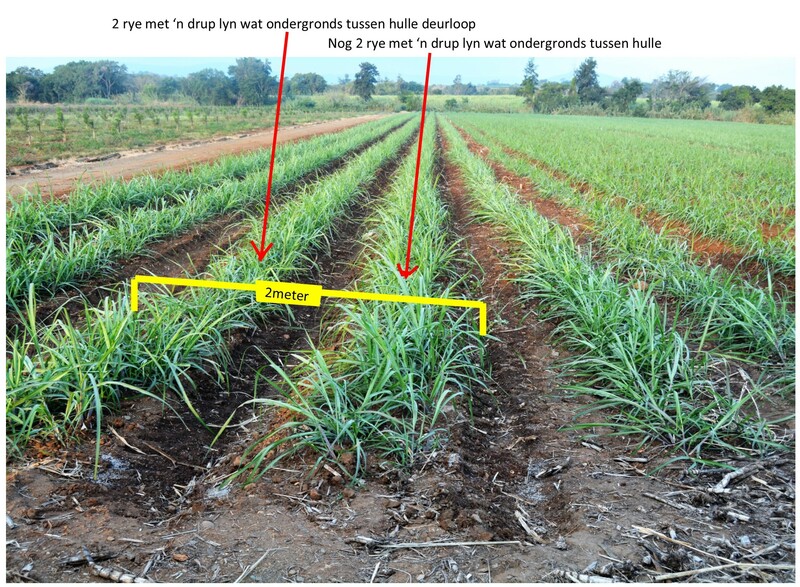 Die Du Plessis het die maatskappy, Inyoni Irrigation, ingekontrakteer om die projek vir hulle te behartig. Die landerye word oorgeplant met die nuwe drup-besproeiing en Thinus gebruik nuwe spasiëring wat spesifiek werk vir drup-besproeiing. Die huidige spasiëring is 2 lyne van 1.45m, nou is dit 4 lyne van 2m. Dit beteken dat hy 3400m meer suikerriet in dieselfde oppervlak kan plant en meer opbrengs uit hierdie oppervlak kan kry. Nog ‘n voordeel van die drup-besproeiing is dat die suikerriet langer gaan hou, alhoewel hy met elke uitploeg van die landery dit sal moet herpyp, hy dit minder gereeld sal hoef te doen. Hy verminder ook die landery-verkeer en sodoende die kompaktering deur gebruik te maak van Matriarchs laaiers in teen stelling met konvensionele laaiers. Die enigste nadeel van die drup-besproeiing is die koste daaraan verbonde maar hulle is vol vertroue dat hierdie belegging alreeds ‘n opbrengs sal toon binne die eerste 2 jaar. Hier is ‘n paar foto’s van die pomphuis. Die ondergrondse vogmeters stuur data na ‘n toep (app) toe en die boer kan daarvolgens die week se besproeiing skeduleer op die rekenaar wat in die pomphuis geinstalleer is. Dis nou tegnologie op ‘n ANDER vlak! In terme van algemene besproeiings advies: Thinus dring daarop aan dat indiepte kennis van elke individuele landery van uiterste belang is. Elke land is uniek en het verskillende vog behoeftes. Hy pas dan die besproeiings programme daarvolgens aan. Party landerye benodig nooit sproeiers nie, maar weereens is daar geen resep nie. “Spandeer tyd in die landerye. Leer wat elkeen benodig”. Op die oomblik hou Thinus van die idee van drup- besproeiing vir sy landerye, maar sal eers sien hoe die eerste 30 hektaar vorder. Indien die opbrengs die geskatte 150t/hektaar lewer, sal dit die koste regverdig om meer te installer. Thinus glo in gereelde grond toetsing. Hy het in die verlede die monsters internasionaal laat toets, maar is nou tevrede dat SASRI se analise en assessering voldoende is. Hy gebruik ten minste 25% minder kunsmis as die ander boere in die omgewing aangesien sy grond so gesond is. Na elke ploeg, voeg hy 2,5t/hektaar gips by. Na elke oes, voeg hy LAN-gebaseerde kunsmis by en hoë pH landerye kry ook addisionele Ammoniumsulfaat. Die Du Plessis verkies om hulle eie kompos te meng wat hulle omtrent R800 per ton bespaar. Hy kan nie verstaan waarom ander boere nie dieselfde eenvoudige koste besparende praktyk implementeer nie, aangesien dit ook verseker dat die mengsel wat jy op jou landerye gebruik, inderdaad is wat jy bestel het en wat jou landerye nodig het. So ver as besonderhede oor NPK ens. kan hy nie meer advies gee as om tyd te spandeer om jou eie landerye te leer ken nie. Indien jy dit doen verseker jy dat daar aan jou landerye se behoeftes voldoen sal word om ‘n goeie opbrengste te kan lewer. Thinus and Charl behartig self die landerye se bewerkings. Hulle bestuur self die trekkers en glo dat hierdie belangrike “intieme” tyd op die landerye van onskatbare waarde is. Jy beleef eerstehands wat die landerye nodig het om ‘n suksesvolle oes te lewer (bv. klippe, grond kwaliteit, kompaktering, ens.) Baie boere beskou eie trekker werk as ‘n vermorsing van hulle tyd, maar Thinus glo dit lewer ‘n groot bydrae tot hulle sukses. Dit is ‘n welkome taak vir Thinus, wat duidelik ‘n liefde het vir sy gekose lewe. Hy staan 4.30 soggens op en begin rondom 5 uur te werk en spandeer net 10% van sy tyd in sy kantoor. Indien hy tot 9 uur saans nog steeds op die landerye besig is, is dit ook goed. Administratiewe werk is minimaal aangesien hulle min rekeninge het. Mel, Charl se vrou, help met die algemene administrasie en die ouditeur kommunikeer enige begrotings afwykings sodra hy dit optel. ’n Eenvoudige maar hoogs suksesvolle besigheid. Hoendervullis is onlangs op hierdie landery gebruik. Sien die skaafsels. Ryk organiese goedheid. Daar is ‘n landery op die plaas wat die Du Plessis nou net aangekoop het, wat omtrent net sand is a.g.v. die Domoina vloede. Hulle gaan die hoendervullis hier aanwend om die organiese inhoud van die grond te verbeter. Die Pongola Rivier, wat aan die nuwe plaas grens, het sy vloei verander na hierdie storm. Onder is ‘n foto van hierdie majestieuse rivier. Onmiddelik na ‘n landery geoes is, word dit besproei. Daar word dan ‘n lang-werkende (6 tot 12 weke) onkruiddoder aangewend. Sodra die landery geplant is, en die lang-werkende onkruiddoder uitgewerk het, gaan hulle met handspuite deur die landerye waar gespesialiseerde werkers vir spesifieke onkruid soek en die onkruid onmiddelik met die regte onkruiddoder spuit wat in hulle sakke is. Charl het baie tyd spandeer om hulle onkruiddoder progam te verfyn en dit het baie goeie resultate tot gevolg gehad. In die verlede het hulle baie sterk onkruiddoders gebruik wat ‘n nadelige effek het op die riet en die grond, maar nou is dit nie meer nodig nie aangesien hulle plaas nou skoner is. Hierdie hoogs gefokusde program bespaar hulle ook baie geld. Indien enige KZN boere sou belangstel, hier vorm luifels in 3 maande in die winter en binne 4 weke in die somer. Thinus skud sy kop en mompel dat Kweek altyd ‘n uitdaging is en hulle konstant besig hou. Die hoogs spesifieke en opgeleide onkruiddoder span. Hierdie is weereens uniek vir elke plaas se omstandighede en omgewing, maar die algemene advies is om ten minste 4 verskillende variëteite op ‘n slag te hê. Die rede hiervoor is dat siektes variëteit-spesifiek is en dat ‘n reeks variëte jou skade aansienlik verminder indien daar ‘n infeksie uitbreek. Op die oomblik het Thinus N57, N53, N49 en N36. Thinus, voor ‘n paar baie indrukwekkende N57’s. Thinus sukkel nie op sy plaas met Eldana nie, maar hulle bly bewus van die risiko en handhaaf sekere praktyke om die nommers laag te hou: hulle probeer om oordra suikerriet te minimaliseer, omdat dit meer vatbaar is. Hulle verseker ook dat die snyers baie laag op die grond sny. Groter bekommernis is RSD en hulle bestry dit effektiewelik deur hulle suikerriet messe in ‘n steriliserende mengsel, ten minste twee keer per dag, te doop. ‘n Twintig liter emmer gaan elke dag saam met elke span uit en hulle word aangemoedig om hulle messe so veel keer as moontlik daarin te doop. Ongelukkig is RSD nie sigbaar nie, en hulle stry elke dag blindelings daarteen. Toetsing vir hierdie probleem vind jaarliks plaas. Hierdie plaas is al vir jare RSD vry, maar hulle hou aan met die gesonde mes-doop praktyk. Op hierdie plaas word alle landerye ryp gemaak. Thinus gebruik Fusilade en is een van die pionier toetsers van Moddus. Hy hou van hierdie nuwe produk deur Syngent, want as jy nie die suikerriet sny nie, sal dit aanhou groei (na ‘n ruk) wat ‘n groter buigsaamheid van suikerriet het aan die einde van die seisoen. Jare terug, in assosiasie met die Eksperiment Stasie, het hulle ‘n Ventury sproei sisteem ontwikkel. Hierdie sisteem koppel met die sproeier besproeiing om die chemikalieë te versprei. Aangesien hierdie sisteem deur die Suikerriet Meule gesubsidieer word (of dit met of sonder ‘n vliegtuig gedoen word), is dit finansieël voordelig vir die boere. Die landerye wat op die oomblik vloed- of drup-beproeiing gebruik, word met ‘n vliegtuig besproei. Belasbare waarde op hierdie suksesvolle plaas is so indrukwekkend soos die tonnemaat. Die snyers werk vir 8 maande en besluit dan of hulle huis toe wil gaan of nie. Indien hulle besluit om nie huis toe te gaan nie, hanteer hulle al die onderhoud en die buiteseisoengewasse op die plaas. Thinus en Charl is die enigste bestuurders op die plaas. Hulle hanteer al die bestuur self en hou van die noue manier waarop hulle alle sake op die plaas hanteer. Groen is die keuse van kleur op die plaas. Die Du Plessis is groot John Deere aanhangers. Hulle het 4 jaar terug begin omskakel na hierdie masjiene toe en dring daarop aan dat hulle nog nooit teruggekyk nie. Hulle mees waardevolle belegging is die trekker wat hulle vir bespuiting gebruik. Dit het ‘n kajuit met ‘n radio en lugverkoeling. Die dankbaarheid van die drywer is wat hierdie trekker so ‘n groot belegging maak, want niks is te veel gevra vandat hy sy nuwe ry-ding het nie. Thinus sê daar is geen geheime tot die sukses van hierdie besigheid nie: net gewone “beste praktyk”: Brand vandag, sny môre en maak seker jou suikerriet is in die meule binne 24 uur. Hy verduidelik dat die koste verbonde daaraan om nie hierdie maklike tydskedule te volg nie, kan lei tot ‘n verlies van – ½% belasbare waarde per dag. Dit kan omgesit word in ‘n verlies van R8500 per hektaar per dag. Op ‘n 100 hektaar plaas, kan dit vinnig eskaleer na ‘n verbysterende R850 000! Dit wys weereens hoe maklik geld verloor kan word, maar ook hoe maklik dit is om dit nie te verloor nie. Bly in fyn kontak met die plaas, werk hard en hou by. Pongola Suikerriet Meule in die afstand. Lekker naby. Die Du Plessis is geregistreerde saadriet verskaffers en voldoen gewoonlik aan hulle eie behoeftes. Hierdie jaar is hulle egter kort en sal moet inkoop. Die Du Plessis het ‘n jong boord Makadamia neute, die oudste is 3 jaar. Thinus beplan om nog boorde hierdie jaar Oktober te plant. In sy hart is hy ‘n suikerrietboer en sal nie nog suikerriet plantasies prys gee vir Makadamia boorde nie. Indien hy sou besluit om meer te plant as wat hy beplan het, sal hy eerder van sy onbewerkte landerye gebruik of nuwe eiendom koop. Hoe gereeld hoor ons nie dat die duiwel in die besonderhede is nie, of dat uitnemendheid net ’n samevatting is baie klein dingetjies, wat alles goed gedoen is? Ek glo opreg in hierdie beginsel en het die Du Plessis sukses eerste hands beleef in klein dingetjies soos respek vir die pad se rand, of ordentelike dreinerings kanale of sommer net die etiese draad wat deur die besluitnemingsproses op hierdie plaas hardloop … dinge wat nie jou wins gaan beïnvloed nie, maar die dinge wat ‘n goeie boer van ‘n briljante boer skei. I haal my hoed af vir hierdie familie wat regtig briljante boere is! Besef die waarde van ‘n kundige Verlengingsbeampte. Thinus sê dat Marius Adendorff meer tyd op die plaas spandeer as sy eie beste vriend. Hy doen niks voor hy nie eers met Marius geskonsulteer het nie. 95% van die tyd sê Marius “dis reg, doen dit”, maar dit is die 5% van die tyd waar Marius ‘n beter voorstel het, wat al vir Thinus baie geld gespaar het of hom gehelp het om ‘n groot fout te vermy. Waardeer alles. Thinus weet dit is ‘n voorreg om ‘n boer te wees, jou eie baas te wees, met geen verkeer nie en om jou eie ding te kan doen. Hy sê alles moet waardeer word. “Dit is daarom belangrik om elke dag jou volle kwota werk in te sit. Sonder maksimum insette, sal die plaas en die wonderlike leefstyl nie volhoubaar wees nie.” Ons het liefde en waardering vir mekaar ook. Soos ons deur die plaas ry kry Thinus ‘n glimlag om sy mond en sê: “Daar is my seun”. Hy draai na my toe en sê: “Ek is so dankbaar om ‘n seun te hê wat hard werk en so self-gemotiveerd is. Jy hoor so baie van families wat sukkel om saam te werk. Ek is so gelukkig – Charl is ongelooflik, ek kon nie vir ‘n beter seun gevra het nie”. Ons stop die bakkie en pa en seun gesels oor hoe Charl met die drup-besproeiing gevorder het. Hulle wedersydse respek en bewondering vir mekaar is tasbaar in die lug. 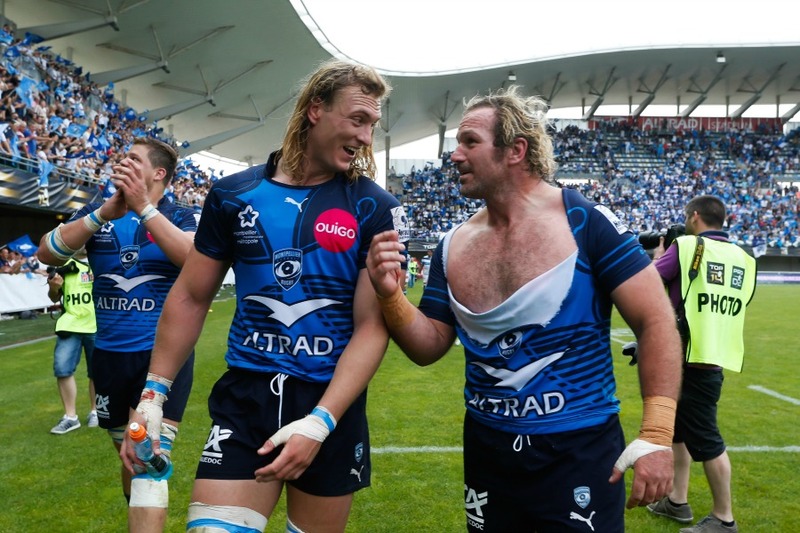 Goed gedaan aan die Du Plessis-manne – julle is ‘n ware inspirasie! Glo in wat jy doen. Thinus glo in sy land, sy produk, en hy is ongelooflik lief vir sy plaas. Akademiese boerdery is bruikbaar tot op ‘n punt, maar om dit na die volgende vlak te neem, vat geloof en passie. Skielik is die son besig om water te trek en ek moet my gastehuis gaan vind. Die dag is verby.